Cartoon Robots are Taking the Animated World by Storm! Cartoon Robots / Anime. It’s no surprise how robots have managed to penetrate the people’s subconscious so strongly. They started early. From cartoons to live action, robots have always been a favorite theme, entertaining and fascinating countless of children, and then the children of these children and so forth. In 1952, a manga created by Osamu Tezuka went on to become one of the most celebrated series of all time. Literally Iron Man Atom or Mighty Atom, Astro Boy’s TV adaptation was the first embodiment of the aesthetic known worldwide as anime. The Astro Boy series became so popular abroad that in 2007 the child robot was named Japan’s envoy for overseas safety. The series consists of several storylines, based on a futuristic world where man and advanced technology co-exist. Cartoon robot Astro Boy is a powerful robot created by Doctor Tenma, in the hopes of replacing his son Tobio, who died in a car crash. When Doctor Tenma realizes that Astro Boy could never fully become human, he rejects him, and Professor Ochanomizu takes Astro Boy as his own. The professor soon discovers that Astro has superior strength and skills, and the ability to experience human emotions. 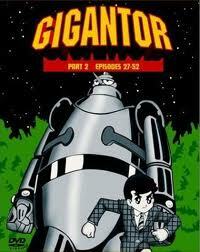 Another American adaptation of a popular Japanese character is Gigantor, originally Tetsujin 28-go, a manga released in 1956 by Mitsuteru Yokoyama It made its U.S. debut in 1964 with altered character names and subdued violence. Set in the year 2000, the show follows the adventures of Little Jimmy Sparks, a 12-year-old boy who can control a huge flying robot named Gigantor with a remote control. Gigantor is made of steel and has a rocket-powered backpack that allows him to fly. He has incredible strength but no mind of his own. His actions are completely dictated by anyone who wields the remote control.Gigantor was initially developed as a weapon by Jimmy’s father, but later reprogrammed to be a guardian of peace. He and Jimmy Sparks go around the world battling crime, mostly villains who are trying to steal the giant robot for their own evil agendas. Gigantor is another example of cartoon robots that can help protect people. Another well-loved anime is the Gundam Series, which features giant war cartoon robots (or mecha, “walking vehicles”) called Gundam. 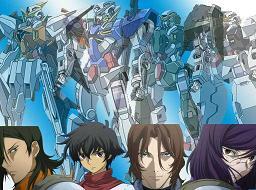 Created and directed by Yoshiyuki Tomino, the metaseries debuted in 1979 as a TV show called “Mobile Suit Gundam.” The story revolves around these mobile suits and their pilots in a fictional universe during the Universal Century year 0079. In this world, the Principality of Zeon has launched a war of independence from the Earth Federation, and destruction and dehumanization prevail on every continent, space colony and nearby lunar settlement. The suffering of humanity opens political and philosophical debates on pacifism, evolution and the nature and meaning of war, making this anime’s plot more realistic than earlier robot animated series which usually cast heroes and villains in the same predictable manner. 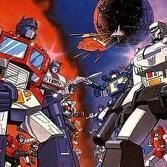 One other original Japanese creation turned international phenomenon is the Transformers cartoon robots franchise. These giant, transforming robots began in the 1980s, with Japanese toy lines Microman and Diaclone. Microman specialized in humanoid figures while Diaclone made robots able to transform into vehicles, electronics or weapons. American toy company Hasbro then bought the Diaclone line, and partnered with Japanese toy company Takara. Hasbro produced a back story for the characters, and Transformers evolved into an epic saga featuring two factions of warring alien robots, the Autobots under Optimus Prime and the Decepticons under Megatron. In its 27-year history, the Transformers franchise has encompassed a wide range of merchandise including comic books, animation, video games and movies. A lot of money is made every year from these cartoon robots. Of course, not all cartoon robots are products of the Japanese imagination. There are plenty of American originals that are as well-loved as their Japanese counterparts, though themes presented in Western cartoons are more inclined towards humor than action. Another notable robot in the arena of cartoon robots is Rosie the Robot Maid is a humanoid robot maid of the Jetsons in the 1960’s animated television. The sweet and caring housekeeper wears a frilly apron on the show, and often seen using vacuum cleaner. Her torso is balanced atop a single leg as she moves about on three tiny wheels. Apparently, she was an old demonstrator model hired by the Jetsons from U-RENT A MAID. 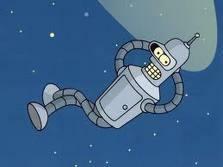 Futurama’s Bender is as a member of the Planet Express crew, an interplanetary delivery company set in the retro-futuristic 31st-century in Matt Groening’s sci-fi cartoon. Unlike most other cartoon robots, this animated robot is often depicted as a sociopath who drinks, smokes and gambles heavily, actually requiring alcohol as fuel for his power circuits. WALL-E is the last remaining trash compactor robot left behind to clean the earth as mass consumerism caused by mega corporation Buy n Large literally trashed the planet in the 21st century. Only WALL-E (or Waste Allocation Load Lifter Earth-Class) remained active, repeatedly salvaging spare parts from other WALL-Es, collecting knickknacks, domesticating a cockroach, and watching Hello Dolly. Wall-E gains a new purpose in life when he meets a sleek, state-of-the-art probe-droid robot named EVE (Extra-terrestrial Vegetation Evaluator). EVE, or Probe One, is one of a troops sent to Earth by Captain Axiom on an undisclosed scanning mission. Together, WALL-E and Eve find an answer to revive the dying planet’s future in this animated adventure by Disney/Pixar. 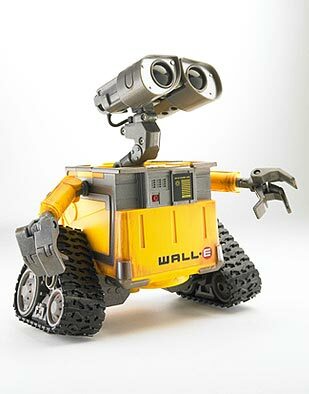 Warm caring cartoon robots such as WALL-E and R2 are good at endearing children and thus helping toy sales along. In the cartoon series My Life as a Teenage Robot, XJ-9, or Jenny Wakeman is a teenage robot originally designed as a battle-robot to protect the Earth, particularly the city of Tremorton, which is regularly attacked by aliens and super villains. Jenny seems happier as a regular teenager though, and would rather hang out with her high school friends Brad and Tuck than battle space criminals. As indicated by her number, she is the ninth in a series of cartoon robots; her prototypes were The XJ-Sisters. Computer animated TV series The Adventures of Jimmy Neutron also features a robot, an electronic pooch named Goddard, who can do eleven million things. His owner Jimmy usually sends him a distress signal whenever he is in trouble, except that Goddard is also usually in some kind of trouble, too. Goddard has been wisely equipped with a variety of inventions within himself for use specifically for such occasions, including ion blasts, paralyzer beams, and the electronic abilities of a dump truck, microwave, blender, and a CD player, among others. 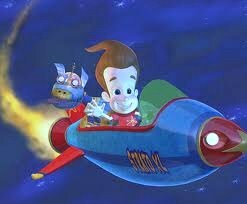 Goddard is also able to speak in Jimmy's voice, presumably through recordings. Cartoon robots like this one are rare. This list doesn’t even cover half of TV and film’s most popular animated robots. No wonder robots have long resided in the hearts and imaginations of children and adults worldwide. Undoubtedly we will see even more of these endearing robots, heroic or comedic, humanoid or machine, fictional and soon.